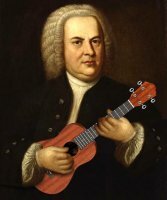 Ukulele aficionados, check it out – this portrait of the great Johann Sebastian Bach playing a uke is sure to bring a smile to your face! Exclusive from GearGems, get yourself or give your favorite uke player this neat image printed on a shirt, mug, stein, clock, hoodie or poster! Here is another UKE design you might enjoy! Click to see all of our Uke Designs on CafePress!